Most days, my alarm goes off at 5:30 a.m. “Sleeping in” is typically anything past 7 a.m. So, exhausted as I’d been the night before, I wasn’t surprised to wake up just after seven Friday morning. Knowing that I had fallen behind on my running, and not wanting to lose too many miles, I went down to the hotel’s fitness center and did 3.5 miles on the treadmill. On the way back to the room, I ran into Jonathan as he was heading down for breakfast, showered, and headed down for my own meal. I seem to think we met up with Dave at the convention center – he was staying closer than we were – and we dove into another day’s gaming. We passed a good chunk of the morning having fun learning and playing complete games (not just demos) of Dread Curse and A Touch of Evil: Dark Gothic at their company booths. 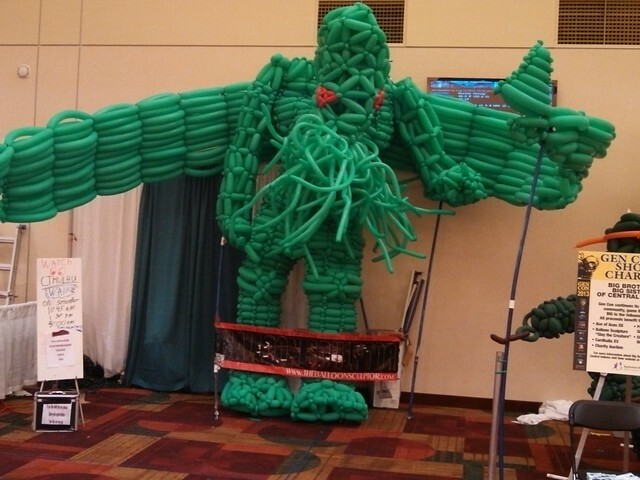 And oh, hey: Giant Balloon Cthulhu. Jonathan had an appointment to keep (I think), so Dave offered to teach me Dungeon Command, which he had brought with him. I had actually planned to attend a panel on game writing, but I was really caught up in playing and learning all these new games, so I ate the peanut butter sandwich I’d made – Yes, I did, in fact, bring a loaf of bread and a jar of peanut butter to keep in the hotel room so we could make sandwiches for during the day. Convention Survival Essential. – skipped the panel, and tried my best to rally an undead army to victory. At some point, Dave and I also played a quick demo of Star Wars: X-Wing Miniatures. Seemed neat and fun, but the demo was awfully short, and nobody got blasted into space dust. Dave and I decided to take a break, then grab dinner nearby before our scheduled True Dungeon run at 7 p.m. I walked back to my hotel to pick up the bag of True Dungeon tokens that Jonathan had been given, and I snagged a 15-minute snooze while I was there. After supper, we met up with Jonathan, Kato & Wendy outside the True Dungeon hall, and for the next couple hours, we fled and fought werewolves and worked our way through a wilderness of puzzling obstacles. 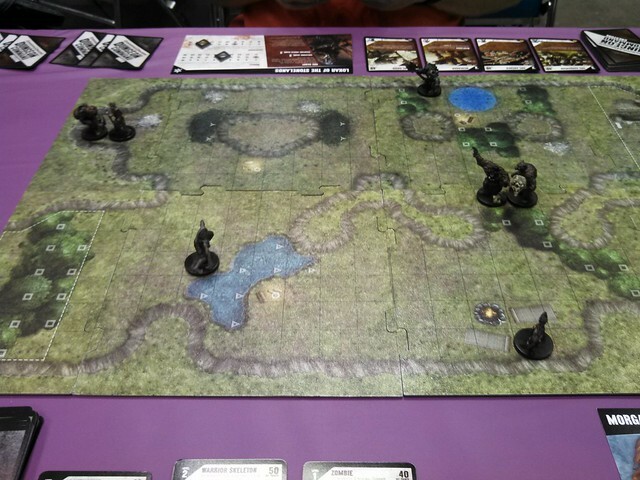 I wrote a detailed piece on our True Dungeon experience for GeekDad, but the short version is that we had a lot of fun. 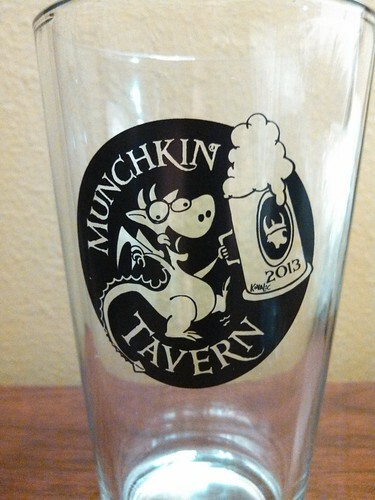 – then walked solo over to check out the Munchkin Tavern and have a beer. Not long after I arrived, Kato and Wendy decided to come over, too. It was a nice night, and we sat out on the deck for awhile just enjoying the surroundings and the company. Picked up a set of pint glasses, which, naturally, come with in-game rules for use during Munchkin. Before leaving, we met John Kovalic, who was sitting at a table inside – bonus points to Wendy for checking Twitter and noticing that he mentioned being at the Tavern. He’s been a Friend of GeekDad for awhile, but this was the first time our paths crossed. Exceptionally nice guy. We left after 11 p.m., and I headed back to my hotel, since Kato and Dave and I were planning to be in line early Saturday for one of the D&D Next playtest sessions. Jonathan was still in the hall gaming close to midnight. This was one of the coolest things about Gen Con: The day ended (or didn’t) when you wanted it to. There were still hundreds of people in the convention center hallways and open gaming areas when I was walking past. I don’t know if the center itself stayed open 24 hours, but even if it didn’t, and you wanted to game all night long, there were possibilities everywhere you looked: Late-night restaurants, hotel lobbies and bars and common areas. Also making for an interesting downtown scene was that weekend’s motorcycle racing event at the Indianapolis Motor Speedway. Lots of bikers – both of the chrome-and-custom crowd and the racing bike enthusiasts – cruising around and gathering on a few blocks closed off for the occasion. (One of which was right outside our hotel. From six stories up, though, the noise didn’t bother me.) Between the bikers and the game geeks and the costumers, there was some top-notch people-watching to be enjoyed. 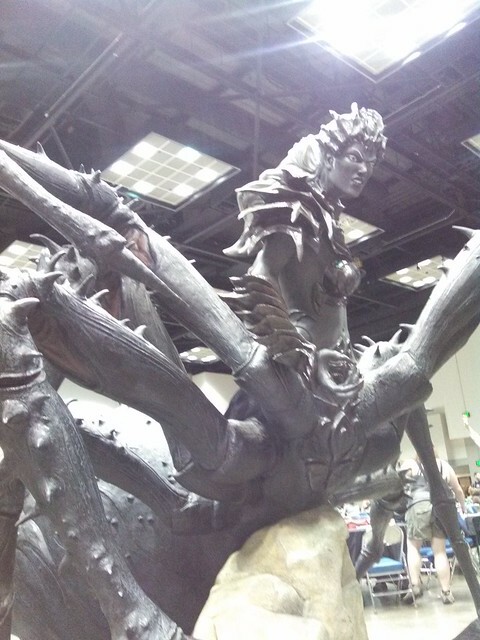 Missed parts one and two of my Gen Con 2013 recollections? Here: Part One – Getting There; Part Two – Thursday, August 15.